•	Tracee McDaniel; Juxtaposed Center for Transformation, Inc.
As a Latina trans woman, the briefing felt like a breath of fresh air; a rare moment where I could witness my community united together, speaking our truths and knowing that we were being heard. This year began in tragedy for my sisters; in just January and February seven trans women of color were murdered in the US, in addition to the killing this week of Mya Shawatza Hall. As someone who has worked to bring national visibility to this violence against trans women of color through the National LGBTQ Task Force's #StopTransMurders campaign, I carry around with me every day the huge emotional weight of each of these murders, and it's easy to lose hope. However, the inspiring transgender leaders present at the briefing -- including audience members from groups such as the Trans Women of Color Collective -- demonstrated that not only are we surviving, we are thriving. We are living in a moment when, for the first time, a handful of transgender women of color celebrities have been in the public spotlight, including Laverne Cox and Janet Mock. Yet only 8 percent of Americans personally know a transgender person. When a trans person is in the news, except for rare exceptions such as when Laverne Cox was nominated for an Emmy, it's almost always about violence. As Janet Mock recently wrote in her blog, "The names of our sisters shouldn't only make headlines when we walk a red carpet or lay in a casket. 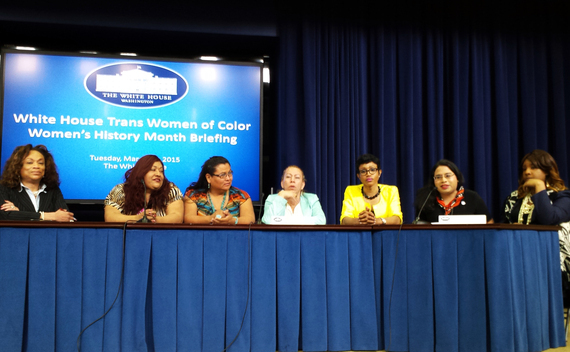 Our visibility shouldn't be subject to such extreme circumstances"
Yesterday's briefing at the White House is one step to changing this narrative and bringing positive visibility to many more trans women of color. Each of the speakers, many of whom had personally experienced anti-trans violence, were an example of the resiliency and vibrancy of our community. Each of those present is working as an advocate to change the narrative about transgender lives -- that our lives matter, that we are hirable, that we deserve good jobs, education, healthcare, safe housing and loving relationships free from violence. Trans people's lives need to stop being criminalized; we are tired of being profiled and harassed by police; we are tired of being imprisoned simply for trying to survive; we are tired of being detained by immigration authorities when we come to the U.S. to escape from violence; we are tired of being harassed, assaulted and being denied medical care in jails, prisons and detention centers; and we are sick and tired of having to prove that we are human beings who deserve dignity and respect. Structural violence and discrimination is an everyday fact of life for transgender people. According to the National Transgender Discrimination Survey, 78 percent of trans people experience harassment at school, and 90 percent experience harassment or discrimination on the job. These and other factors lead to high unemployment and homelessness rates, which contribute to trans people being four times more likely to live in extreme poverty -- reporting a household income of less than $10,000 per year -- than the general population. Trans people of color suffer the most from this structural discrimination, with 34 percent of black trans people, 28 percent of Latino/a trans people, 23 percent of American Indian/Alaskan Native trans people and 18 percent of Asian American trans people living in extreme poverty. It is clear that working towards economic justice must go hand-in-hand with our work to end violence against trans people. On Wednesday night, at an office two blocks from the White House, I attended an inaugural celebration of the opening of the new national office of the Trans Women of Color Collective (TWOCC) and Casa Ruby's new TransLife Center. Both organizations are founded and led by trans women of color, and both are engaged in powerful advocacy to ensure that our lives are valued. Economic empowerment and leadership development are central to the missions of both organizations. It is so necessary that we as trans sisters help each other access jobs, housing and other needs, because we best know how to care for each other. And we need our allies to support us with resources and opportunities that will allow our organizations to thrive. There is nothing more powerful and needed than trans women of color nurturing and supporting other trans women of color in becoming powerful new leaders and spokeswomen for our own liberation. In February, at the National LGBTQ Task Force's Creating Change Conference in Denver, nearly 100 transgender and queer people of color stormed the stage, unified by the message "Trans Lives Matter." They called attention to the recent murders and structural violence against trans women of color, and the recent killing of queer Latina Jessie Hernandez by Denver Police. Bamby Salcedo, one of the panelists at the White House briefing, was also one of the leaders of the protest at Creating Change. During the protest she declared that Trans People of Color are in a "state of emergency" and presented a list of demands for how the LGBTQ movement can address this emergency. One of her key demands was that LGBTQ and allied organizations "leverage their access to policy makers and funders and use their privilege to support trans-led efforts in eradicating the ongoing structural violence that our community faces." Tuesday's White House briefing demonstrated the commitment of the National LGBTQ Task Force to ending this state of emergency. While speaking with Bamby after the White House briefing she told me "the Task Force heard us." But this is only a start, and we have a long way to go to. The LGBTQ movement has to continue to use our resources to center the voices of and support those most marginalized by systemic oppression including racism, transphobia and sexism. There is also a shameful history of the LGBTQ movement silencing and invisibilizing the very trans women of color who founded this movement -- Marsha P. Johnson, Sylvia Rivera and more -- that we must be accountable for and work to reverse. I'm excited to have the privilege to do this work every day in my role at the National LGBTQ Task Force. Every day I ask myself, what more can I do to use my space, my privilege, to make space for and lift up the leadership of other trans women of color. I urge everyone who is working for LGBTQ equality to join me in this commitment. Together we can ensure every member of our community can live free of violence, free of persecution and able to fully embody our diverse identities in every aspects of our lives.